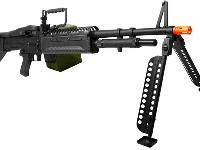 Dominate your battlefield competition with the awesome A&K M60 Machine Gun . 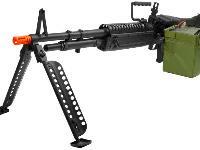 This heavy-duty, rapid firing monster is an authentic replica of the classic Vietnam era M60 machine gun, and is very realistic in look and feel. 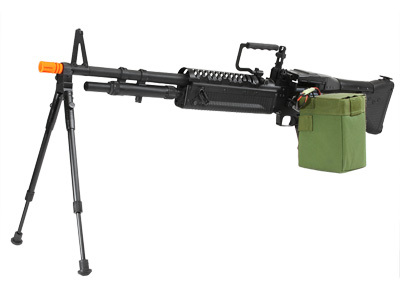 The gun features an integrated folding metal bipod, a high-capacity 3000 Rd electric box magazine, and a shot velocity of 380-400 fps (using .20g BBs). 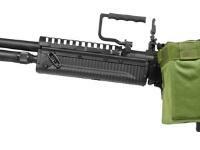 The A&K M60 also features an adjustable rate of fire and an ambidextrous fire selector switch, making it a very versatile and powerful airsoft weapon in the battlefield. 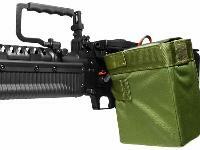 Airsoft enthusiasts, don't miss your chance to own a piece of American arms history. 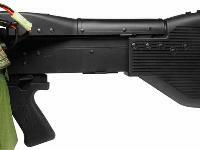 Take aim and fire! 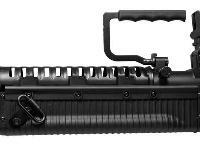 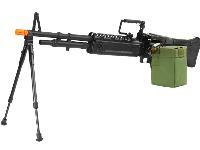 The A&K M60 Machine Gun also comes with a 9.6V 1200 mAh Battery, and a 9.6V 300 mA Battery Charger. 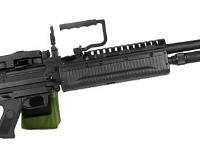 The refurbished M60 comes with the replacement bipod shown in the product page image above. 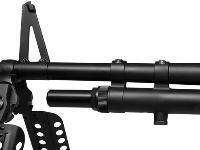 The original bipod shown in the closeup images is NOT included in the box.